The MLB has been pushing the Franchise Four as well as the best living four baseball players (link to vote) recently where you can vote for your teams (or any teams) “four most influential players who best represent the history of each franchise”. These players will be revealed at the All-Star game in Cincinnati on July 14th at 7:30. When I wrote on the Pepper Baseball blog, I did something along these lines where I created my Mt. 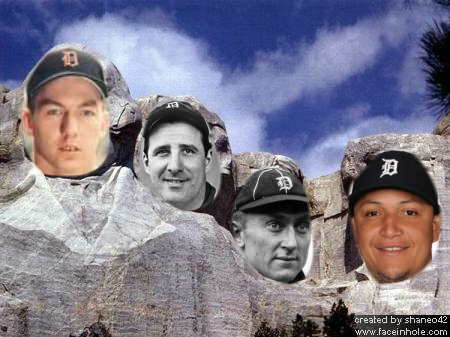 Rushmore of Tigers players, but figured that now this is officially a thing, that I’d write about it again and reconsider my choices. For the Tigers, MLB gives the choice of Miguel Cabrera, Ty Cobb, Sam Crawford, Charlie Gehringer, Hank Greenberg, Al Kaline, Alan Trammell, and Justin Verlander. You also have the choice to write-in a vote. My first take is that they got most of the players correct, although I’ll debate that Verlander probably should not be on the list as he can’t be the Tigers best pitcher of all-time, can he? Right off the top, I’m taking JV and Tram out, leaving six choices for four spots. Without a doubt Ty Cobb is on my list and I think Miguel Cabrera will be one of the top-5 right handed hitters of all time when his careers over. This leaves me with Greenberg, Kaline, Crawford, and Gehringer, so let’s get to work. Gehringer played his entire career for the Tigers which was 19-years from 1924 to 1942. Charlie was elected to the Hall of Fame as a second baseman in 1949 and retired with a career .320 batting average, 2,839 hits, 1,775 runs scored, 574 doubles, 184 home runs, and 1,427 runs batted in. Charlie won the World Series with the Tigers in 1935 and lost two others in 1934 and 1940. Gehringer was an MVP In 1937 and a top-5 finished two other times. If you’re in to WAR, he accumulated a career WAR of 80.6. Baseball-Reference JAWS rating, rates Charlie as the 5th best 2nd baseman all-time. Gehringer ranks second on the all-time Tigers list in runs (Cobb), third in hits (Cobb/Kaline), 2nd in doubles (Cobb), 4th in RBI (Cobb, Kaline, Heilmann), and eighth in batting average with 1900 or more at bats. Sam Crawford played for the Tigers from 1903 to 1917 with four seasons spent with the Cincinnati Reds from 1899-1902. Crawford a Hall of Famer (1957 Veterans Committee) finished his career with a .309 batting average, 2,961 hits, 458 doubles, 309 triples, 1,391 runs scored, 97 home runs, 1,525 RBI, 367 steals, and a WAR of 75.1. Crawford had never won an MVP, although he finished second in 1914, he does hold the career best for triples and although he didn’t hit a lot of homers in the dead ball era, he does sit 79th all-time in extra base hits. Baseball-Reference rates Sam Crawford as the 12th best right fielder of all-time via their JAWS rating system. Hank Greenberg played only a total of 13 seasons from 1930-1947, as he served in the Air Force during World War 2 from 1942-1944. Still, Greenberg was able to hit .311 for his career with 1,046 runs, 1,628 hits, 379 doubles, 331 home runs, 1,274 RBI, and a WAR of 57.5. Hank had won two MVP’s before the war and finished 8th in 1945, however with 44 homers and 127 RBI that season, you’d think he’d finish higher. Greenberg was elected to the Hall of Fame in 1956 on his 10th try and ranks 15th on Baseball-Reference for First Basemen. Mr. Tiger roamed the outfield in Detroit for 22 seasons from 1953 to 1974 and finished his career with a World Series ring in 1968 and was elected to the Hall of Fame in his first year of eligibility in 1980. Kaline finished his career with a .297 batting average, 1,622 runs scored, 3,007 hits, 498 doubles, 399 home runs, 1,582 RBI, 137 steals, and a WAR of 92.5. Kaline was never an MVP, but was a top-5 vote getter 4-times, won a batting title in 1955, won 10 Gold Gloves, and made 15 All-Star games. Kaline ranks 3rd in runs scored on the all-time Tigers list, 2nd in hits, 3rd in doubles, 1st in home runs, 2nd in RBI, and 22nd in batting average with 1900 at bats or more. Baseball-Reference JAWS ranking, places Kaline 7th on the top Right Fielders of all-time list. So Kaline joins Cabrera and Cobb on my list and I am eliminating Crawford leaving a very tough decision between Gehringer and Greenberg. At the end of the day, I choose Hank Greenberg based on his two MVP’d and war shortened career,, although I’d have very little argument if someone chose Gehringer instead. .321 batting average, 1,178 runs scored, 2,220 hits, 470 doubles, 396 home runs, 1,388 RBI, 60.8 WAR. Baseball-Reference has Cabrera tied for 15th best first baseman of all-time. Do you agree/disagree and who would you have placed on this list instead?? ?